How much is the Bose Sound Dock here in Malaysia? Available only @ Atlas Hifi? 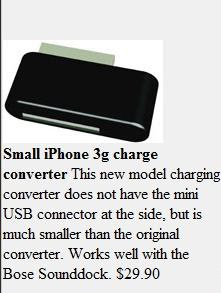 Would it charge my iPhone 3GS without the charge converter? I don't know how much it costs in Malaysia. I bought mine here in the US. 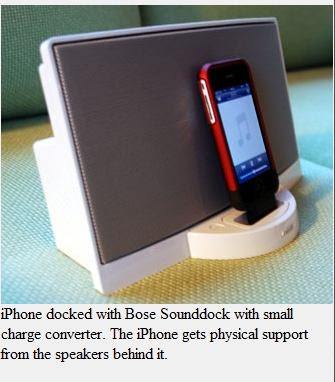 I am pretty certain that the latest model of the Bose Sound Dock is compatible with the iPhone 3g. The one I have is an earlier model, and that one doesn't charge the iPhone 3g. However, you can double check by checking the specs and also test it with your iPhone and see if it charges. I'm glad to find this info. I love my Bose Sound Dock but it doesn't charge my new iPod Touch (as the message on the screen states). I called Bose and they explained the FireWire/USB problem but told me that for $99.99 they could refurbish it (to work with the newer iPods) or I could trade it in for the new portable Sound Dock for $179.99. I like the $29.90 converter idea better!